Another Labor Day weekend has come and gone, and with it the annual session I reserve just for canning tomatoes. Now at their peak, I took advantage of Orange Circle Farm’s online system to order enough Roma tomatoes to last me the coming winter. As one of the paste variety of tomatoes, these luscious beauties have a high flesh to seed ratio and minimal amount of core, making them well-suited to canning, and a joy to handle and process. Through the years I’ve canned tomatoes in various forms — whole, sauced, as ketchup and paste — and it’s as crushed that I’ve come to rely on as a staple. 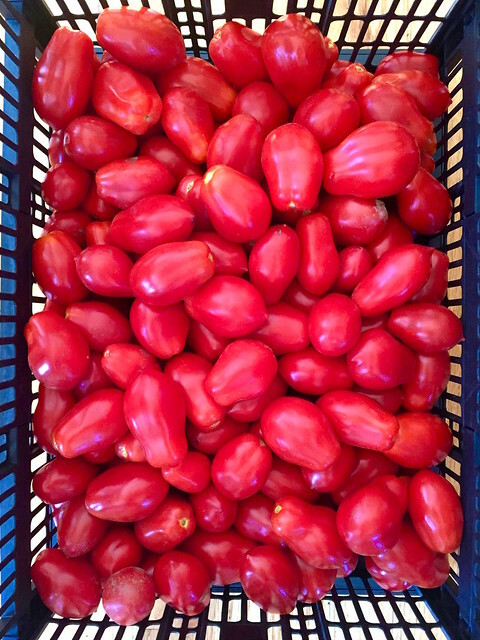 The tomatoes are packed conveniently in their own juices, and the processing time is less then if left whole. Figuring that 20 pounds would yield a dozen pints, I somehow came up with 16, so count on somewhere between the two. As for the upside down jars, a quick flip after leaving them to cool overnight allows the solids to settle back into their liquids. 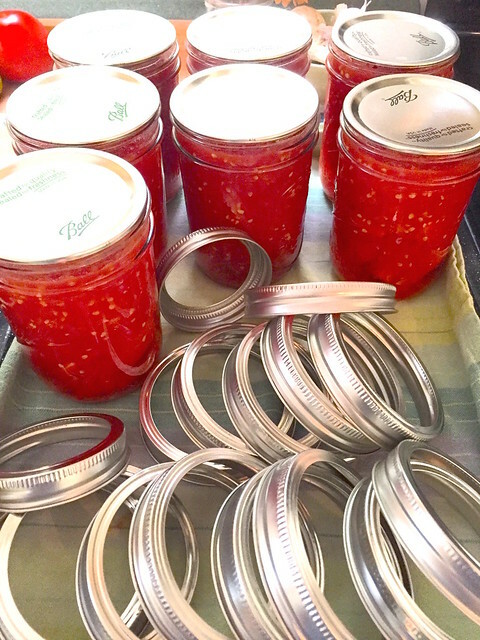 Canning tip: If using a boiling water canner and once the processing time is up, turn off the heat, remove the pot lid, and let the jars sit for an additional 5 minutes before lifting them out of the pot. This slight cooling period helps to prevent siphoning — the contents being forced out due to the sudden change in temperature when the jars are removed from the hot bath — a common occurrence. After the jars have been left to cool undisturbed for 12 to 24 hours, remove the rings, check the seal and give the jars a quick rinse to remove any food residue. And, yes, for those who’ve asked, it’s recommended that jars be stored without the ring bands to allow you to see if the vacuum seal is broken. Has this much time passed already? This post coincidentally marks the fifth anniversary of Diary of a Tomato — I am ever so grateful to you all, dear friends, for your continued support and readership, and look forward to sharing the ever-changing seasons to come. 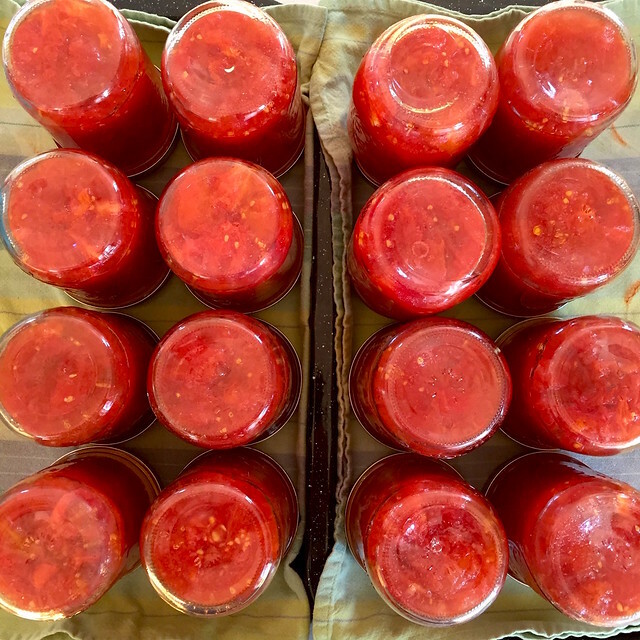 For paste tomatoes, check out Orange Circle Farm’s online ordering form or their Pop-Up Farmstand on Saturdays in Wallingford Square, Kittery; or visit your nearest farmers’ market. The National Center for Home Food Preservation has a section devoted to Canning Tomatoes and Tomato Products, including Crushed Tomatoes. If you have the space, Freezing Tomatoes is still the fastest and easiest way to preserve them — no peeling, just core, bag and freeze — check out this brief how-to video. This entry was posted in cooking, preserving and tagged canning, tomatoes. Bookmark the permalink. Beautiful!!! My daughters have always frozen tomatoes while we continued to can. This year I joined them in freezing our crop of tomatoes. It’s a lot less work but I do miss seeing the final product… jars of tomatoes on the shelf. Happy blog-iversary! I didn’t know about the inversion trick. I have 40 lbs. waiting for me for a salsa/crushed tomato session tomorrow! Thanks, Kate! I like to invert the jars after cooling to move the solids away from being smushed up against the lids, this way they’re not in contact during storage. I was tempted to go for another 20 pounds myself!